From the years leading up to the switch to digital. Taken with an Olympus OM2n with OM 24mm, 35mm, 50mm and (rarely) 100mm lenses with an occasional intruder from my vintage camera collection such as my Retina 1B. Accessing Camera Raw Filter in Photoshop CC allows scanned images to be processed to modern digital photography standards. ref: 091006H(33-36) Rannerdale Knotts from Peel at the far end of Crummock Water. 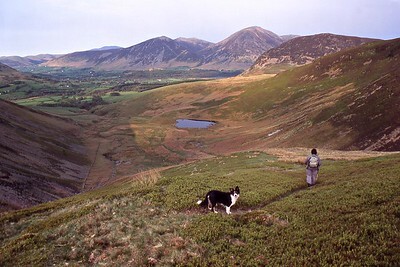 The slopes of Grasmoor at left; of Mellbreak at right; with High Stile smothered in cloud. A photomerge of 4 negatives, spoiled by the leftmost one having camera shake. Taken with 1957 Kodak Retina 1B with f2.8 50mm Xenar lens. 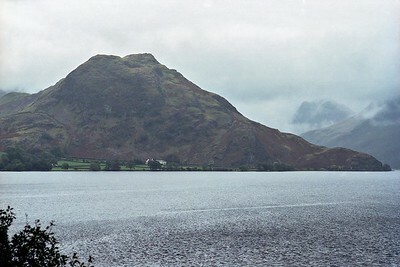 ref: 091006F22 Seen from Peel, at the far end of Crummock Water. ref: 091001F36 512 m (1,680 ft). 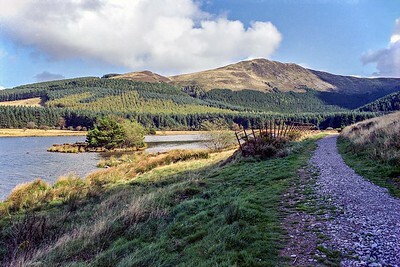 Loweswater below; Burnbank Fell at left; the Loweswter Fells of Darling Fell and Low Fell at right. 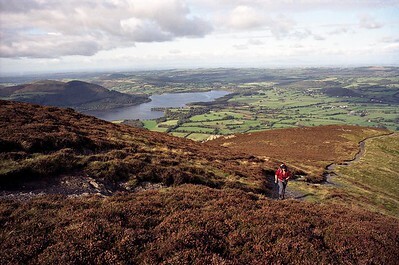 Low Fell being Walt Poucher's 'Best View In The District' and where his ashes were scattered. 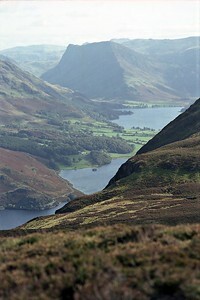 ref: 091001F35 Crummock Water directly below; Buttermere further away. 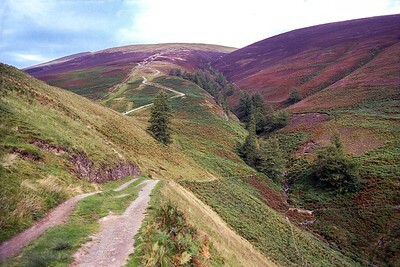 The narrow road circumnavigating Rannerdale Knotts is clearly seen. OM2n with 100mm lens. ref: 091007G34 Unusual view seen from the Embleton road. OM2n with f2.8 100mm lens. 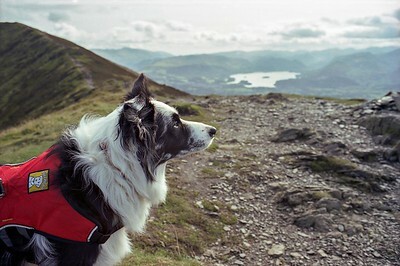 Cassie On Ullock Pike Summit. 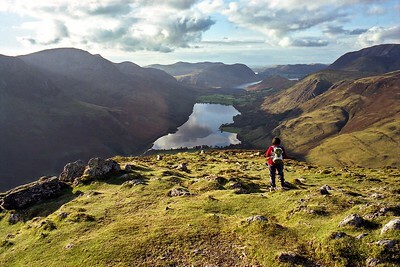 ref: 0910G12 View over Buttermere to Crummock Water. Mellbreak and that Blake Fell. A glimpse of Loweswater. 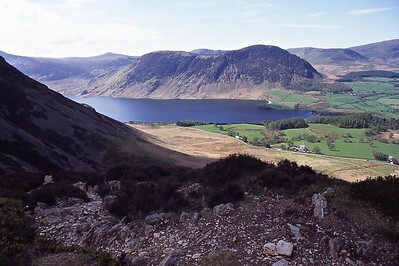 The Loweswater Fells (Low Fell & Darling Fell) with Rannerdale Knotts splitting Crummock Water. 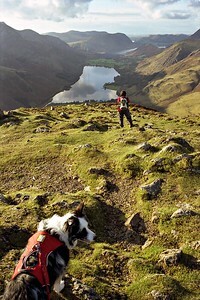 ref: 0910G13 Fleetwith Pike is an easy ascent up the old tramway from the top of Honister Pass. This view is the reason to climb it. 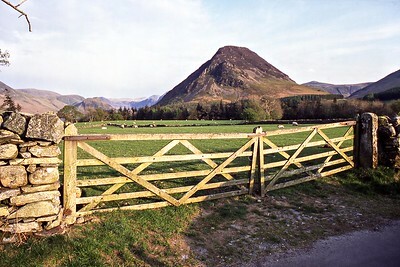 The High Stile range of High Crag, High Stile and Red Pike, dominate the left of the frame. 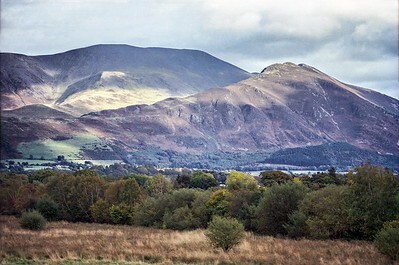 Mellbreak, with Blake Fell beyond, is centre left; with a glimpse of Loweswater beyond and with the Loweswater Fells (Low Fell and Darling Fell to its right. 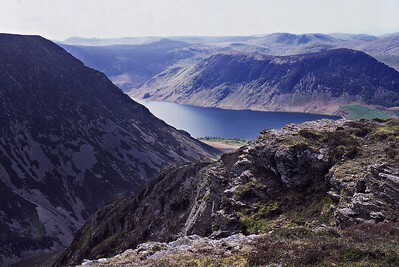 Rannerdale Knotts, centre, splits Crummock Water in two. 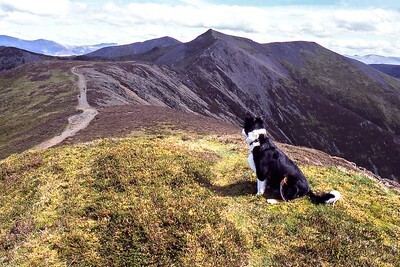 At right is Grasmoor; with High Snockrigg in front, and the slopes of Robinson nearest to us. 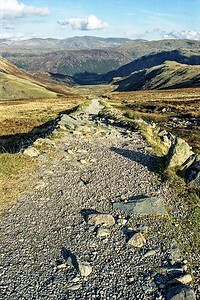 ref: 100905G15 Leaving Latrigg on the Cumbrian Way and leading down to the crossing of the Whit Beck. 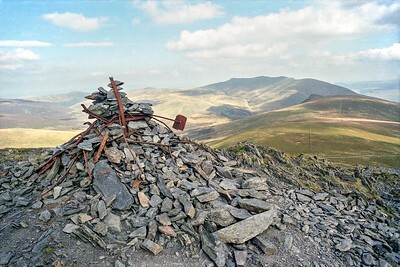 ref: 100905G24 Looking East over Lonscale Fell to Blencathra. An exhibit in the Tate Modern, perhaps? 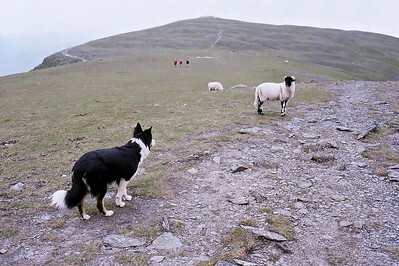 ref: 061100pr01 Gael confronting lamb. Never had to train her not to chase sheep. 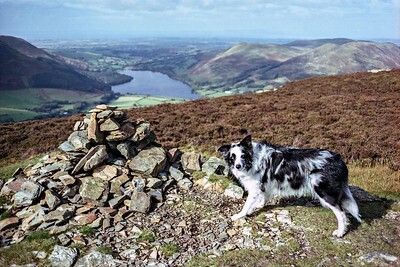 ref: 070427pr35 Backdrop: Whinlatter Pass; the shadow of Skiddaw behind the ridge extending from Whiteside. 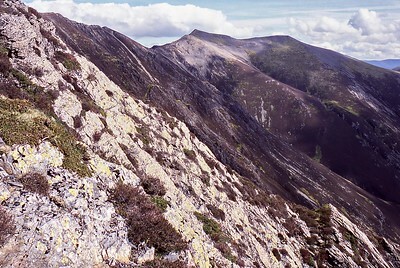 Centre distant is Hopegill Head and Sand Hill; prominent is Grasmoor. Dark bulk of Mellbreak in the middle ground, right. ref: 070426pr27 From Whin Ben on the ascent of Whiteside. 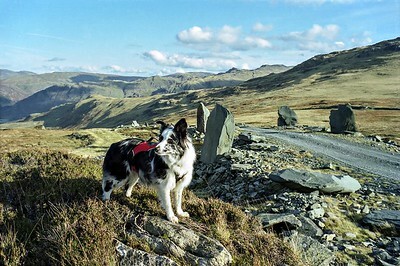 Lanthwaite Green Farm below; Lanthwaite Wood centre right.